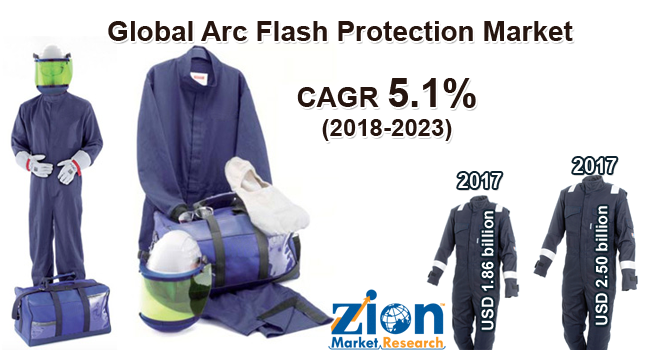 Global arc flash protection market expected to reach USD 2.50 billion in 2023, growing at a CAGR of 5.1% between 2018 and 2023. Major driving factors for the growth of arc flash protection market are an increase in the cost of the electrical network, substitution of existing electrical safety equipment and expansions of the developed sector in South East Asia. The report covers forecast and analysis for the arc flash protection market on a global and regional level. The study provides historical data from 2015 to 2017 along with a forecast from 2018 to 2023 based on revenue (USD Billion). The study covers major driving forces and restraints for the arc flash protection market along with the impact they have on the demand within the forecast period. Additionally, the report provides the study of prospects available in the arc flash protection market on a global level. In order to give the users of this report a comprehensive view on the arc flash protection, we have included a detailed competitive scenario and equipment portfolio of key vendors. To understand the competitive landscape in the market, an analysis of Porter’s Five Forces model for the arc flash protection market has also been included. The study comprehends a market attractiveness analysis, wherein bifurcations are paradigm based market size, growth rate and its attractiveness. The study provides a decisive view on the arc flash protection market by segmenting the market based on equipment and end users. The segments covered in the study have been analyzed on the present and future trends and the market is estimated from 2018 to 2023. Key equipment segments covered under this study include personal protective equipment and arc flash detection & control system. On the basis of end users, the market has been segmented into infrastructure, utilities, oil & gas, and others. The regional segmentation includes the current and forecasted demand for North America, Europe, Asia Pacific, Latin America, and the Middle East and Africa. Each region has been further segmented into major countries such as the U.S., the U.K., France, Germany, China, India, Japan, and Brazil. This segmentation includes demand for Arc Flash Protection based on individual end-users in all the regions and countries. The report covers detailed competitive outlook including the market share and company profiles of the key participants operating in the global market. Some of the major players involved in the global arc flash protection market include General Electric Company, Larsen & Toubro Limited, ABB Ltd, Siemens AG, Eaton Corporation, Arcteq Relay Ltd, NR Electric Co Ltd, Rittal GmbH & Co. KG, Schneider Electric SE, G&W Electric Company and Mors Smitt Technologies Inc.